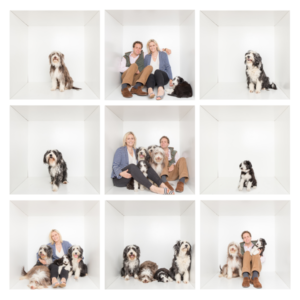 We now incorporate The Box into all our studio sessions to give our clients more variety and to end the shoot on a high. Put your whole family in the box!!! The bigger the family, the better, even the grandparents can join in. 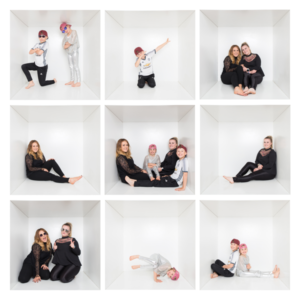 We have had 7 adults in the box at one time! A beautifully framed box shoot looks amazing up on the wall, a centerpiece in any home. The box shoot is all about having fun, the more fun you have in the box, the better the final photos will look. Let your hair down and be as silly as you like. The aim for our photographer is to capture the essence, the personality of the family or group of friends. If you have some crazy, wacky ideas please do share them with the photographer. Put your family in the box, you won’t be disappointed. Listed below are the most commonly asked questions we receive about photography in The Box. To view the answer to any question, simply click/touch the question to reveal the answer. If you have a question that isn’t answered below, simply head over to our contact page to ask. Q: What is the price of a Boxshoot? 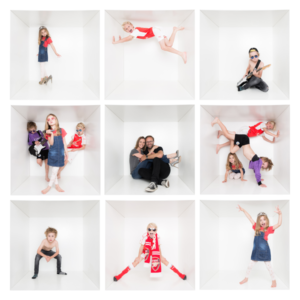 Our Boxshoot has now been incorporated into our standard family photoshoot at no extra cost. Our family photoshoot is £95 for 1 hour. Q: What happens after the Boxshoot? After your shoot you will be invited back to view all your edited photo’s in our beautiful viewing room. You will get to see all your edited studio photos along with montage box images. Q: What products can I purchase during my Ordering Session? We have a number of different packages which include products for The Box and studio images. Our photographer will discuss our products with you after your shoot. Q: Can we bring our pets to the shoot? Absolutely yes. We have have a few dogs in the box. If you have a pet who is part of your family then please bring them along.